How do I backup files from multiple computers to a single IDrive account? How to backup files from multiple iOS and Android devices to a single IDrive account? I have backed up files from multiple computers and mobile mobiles. How do I restore? Does IDrive support Synology backup? Download and install IDrive on all your computers that are to be backed up. After installation, you will have to login or create a new account. 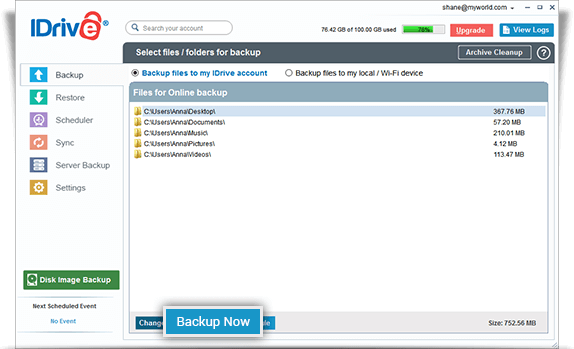 On successful login, IDrive creates a default backup set including important folders from your computer. Click the 'Start Backup Immediately' button to start the backup. By default, IDrive creates a unique folder with the name of the computer to prevent data overlap during multiple computers backup. Download and install IDrive app on all your mobile devices that are to be backed up. On first time login, tap 'Backup Now' button to backup your device contacts, photos, videos and calendar events. For succeeding backups, tap on the 'Backup' button in the device folders to backup. I have backed up files from multiple computers and mobile devices. How do I restore? 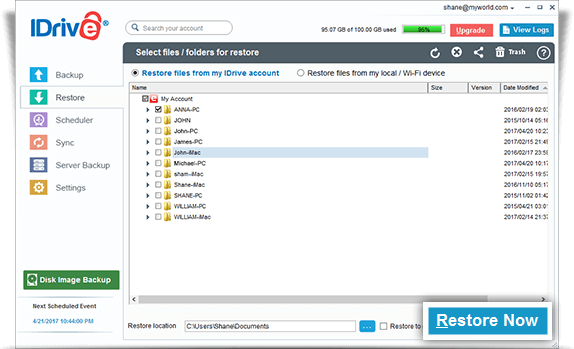 There are different ways to restore files from your IDrive account. Select the computer or mobile device folder from the 'Restore' tab. A list of files and folders that are backed up are displayed. Select the files and folders by using the checkbox. Select the computer or mobile device folder to restore. A list of files and folders that are backed up are displayed. Click on the drop-down arrow against the file name and choose 'Download' option. Select the computer or mobile device folder and a list of files and folders that are backed up are displayed. Open the file to restore and tap on restore icon. Currently, iOS device supports photo and video restore only. Yes, you can securely backup all the files on your Synology NAS device to your cloud account using the IDrive Synology Backup app.